Michael Fogus is software developer with experience in distributed simulation, machine vision, and expert systems construction. He's actively involved in the Clojure and Scala communities. Chris Houser is a primary contributor to Clojure and has implemented several features for the language. 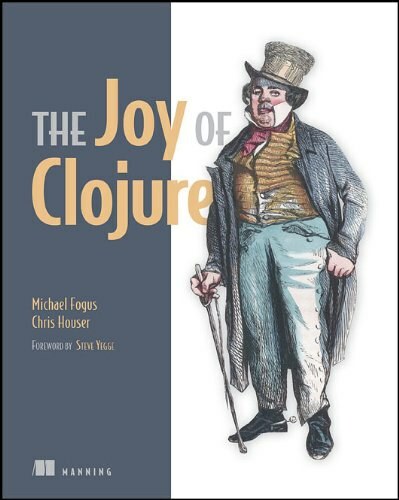 Best Clojure book on the market. Harder to read than the rest, though. Now you could write out the nested if structure manually and achieve the same result, but the beauty of macros lies in the fact that they can do so on your behalf while presenting a lightweight and intuitive form. In cases where do-until can be used, it removes the need to write and maintain superfluous boilerplate code. 总算是看到把宏的作用说清楚的书了。其他的所有书讲到宏都讲得牛X得不行。什么代..
Now you could write out the nested if structure manually and achieve the same result, but the beauty of macros lies in the fact that they can do so on your behalf while presenting a lightweight and intuitive form. In cases where do-until can be used, it removes the need to write and maintain superfluous boilerplate code. In some sense, all this was inevitable, I think. Lisp—the notion of writing your code directly in tree form—is an idea that’s discovered time and again. People have tried all sorts of crazy alternatives, writing code in XML or in opaque binary formats or using cumbersome code generators. But their artificial Byzantine empires always fall into disrepair or crush themselves into collapse while Lisp, the road that wanders through time, remains simple, elegant, and pure. All we needed to get back on that road was a modern approach, and Rich Hickey has given it to us in Clojure.